Out of the blue we have a home run. I have been reading material that discourages the use of milk forever and i naturally assumed that this extended to cheese and yogurt. Why would i not? Yet for all my adult life i have consumed little milk unless it was in the form of cheese or yogurt. worse, i really do not wish to give up cheese in my general diet becasue i use it as a meat replacement. So this happens to be wonderful news for myself personally. I just could not give up cheese and now i do not have to. This is also the best possible news for the dairy industry generally. Both butter and cheese have now been strongly endorsed by improving science. Now we obviously need to compare pasteurized milk with raw milk as well. I do not expect a change but we seem to be successful with irony today. A large study by researchers from the City University of New York has found that pasteurized milk increases the risk of death and the risk of bone fractures, while the yogurt and cheese has the opposite effects. The research, published in the British Medical Journal, followed 61,433 women between 39 and 74 years old at the beginning of the study and 45,339 men aged between 45 and 79 years old at the beginning of the study. The researchers then followed the women for an average of 20 years and followed the men for an average of 11 years. The researchers then correlated the average number of glasses of milk per day was consumed over that period, using food frequency questionnaires. The researchers measured death among the groups and bone fracture rates along with inflammation markers PGF2-alpha collected from urine and interleukin-6 (IL-6) collected from the blood. Among the women, the researchers found that three or more glasses of milk per day nearly doubled the incidence of death (by 93 percent) compared to those who drank none or less than one glass of milk per day. Three or more glasses of milk per day in women also increased deaths from cardiovascular disease by over 90 percent and increased incidence of cancer by 44 percent. And despite expectations that milk reduces the risk of bone fractures, three glasses of milk per day or more increased the risk of hip fractures by 60 percent and the risk of bone fractures by 16 percent. While the follow-up period in men was almost half of the women – at 11 years – the men also showed higher risks of death and cardiovascular disease from those drinking three or more glasses of milk per day – although only by about 10 percent. The men drinking more than three glasses of milk per day did not have an increased risk of bone fractures or hip fractures. While the majority focused upon the fact that pasteurized milk increases mortality, cardiovascular disease and cancer, cheese, yogurt and fermented (cultured) milk had the opposite effect. Women eating 60 grams or more cheese per day (a couple of slices) in particular reduced the risk of mortality by at least 30 percent – and up to 49 percent (almost half) – when not cancelling out the effects of some of the nutrients in the cheese. An interesting inverse model for calculation – in the base model adjusted by age only, the effect is 49 percent, but in the model (3) where all the effects of the other nutrients that cheese contains are canceled, the effect is lessened. When negative effects are measured, it is helpful to eliminate the possible positive effects from the milk in terms of nutrients from its harmful effects. But when the equation is flipped in the case of yogurt and cheese – the effects of the nutrients add to its benefits. Using this range, incidence of deaths from cardiovascular disease decreased from 37 percent to 52 percent, and deaths from cancer decreased from 5 percent to 15 percent among women who ate 60 grams or more of cheese a day. Both hip fractures and bone fracture incidence decreased among the women eating more than 60 grams of cheese a day – ranging from 50 percent lower (by half) to 36 percent lower for hip fractures. Among men, even with the reduced follow-up period, mortality incidence among the men was reduced by between 14 and 18 percent – depending upon the model – while death from cardiovascular disease decreased by between 13 and 22 percent. Mortality from cancer was insignificant. Bone fracture incidence was also decreased among the cheesy men, ranging from 25 to 23 percent lower among men eating more than 60 grams of cheese a day. 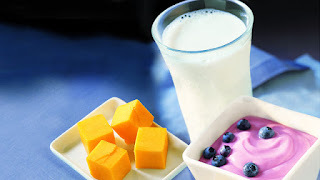 Eating 400 grams of yogurt or fermented milk per day (less than two cups) was also healthier for both men and women. Compared to those who ate little or no yogurt or fermented milk, women experienced a reduced morality ranging from 14 percent to 38 percent, and reduced death from heart disease at between 7 and 32 percent. Cancer deaths also decreased among yogurt eaters, by between 19 and 25 percent. Bone fractures also decreased among yogurt-eating women. Hip fractures decreased by between 30 and 51 percent. Among men, 400 grams or more of yogurt or fermented milk a day decreased the incidence of death by between 10 and 17 percent, heart disease deaths by between 10 and 16 percent, and cancer deaths by between 11 and 17 percent. Yogurt-eating men also had 25 percent fewer hip fractures than non-yogurt eating men. Because we know that 99 percent of the milk being consumed is pasteurized, while yogurt and cheese are fermented, this study is a verdict on pasteurized milk. The large study indicates what smaller studies have concluded: That Mother Nature designed milk – whether it is mother’s milk, goat’s milk, cow’s milk or camel’s milk – to be naturally fermented by those probiotic bacteria that naturally inhabit our bodies. Is Galactose is the Culprit? The researchers noted that the likely reason for the deleterious effect of the milk for both men and women – including death, cardiovascular disease and increased bone fractures – was the content of D-galactose within milk. This is because they find from other research that galactose is broken down and thus typically significantly lower in both cheese and yogurt. That is, the probiotics are breaking this problematic sugar into harmless compounds. However, other research has found milk’s casein content to be unhealthy – seemingly at the root of many food sensitivities and consequential conditions. Still other research has indicated lactose to be problematic, especially for those with reduced availability of lactase. Others have discussed the potential effects of Insulin-like growth factor (IGF) in milk. While present in very minute levels in pasteurized milk, there is good scientific reason to believe probiotics provide a balancing effect upon the gut with regard to IGF-1. And the other elements – casein and lactose – are also substantially broken down or changed by colonies of the right probiotics, which include species of lactobacilli. For this reason, many cheeses – especially mature varieties (allowing the probiotic fermentation process to continue) – are naturally low in lactose and galactose, as is most yogurt. As for casein, the cheese-making and yogurt-making fermentation processes introduce casein-cleaving proteases such as chymosin – naturally produced by probiotic bacteria. But these are details. The bigger picture – rendered by this large study of over 100,000 people followed for more than a decade – indicates that pasteurized milk is unhealthy while cheese and yogurt are not. Michaëlsson K, Wolk A, Langenskiöld S, Basu S, Warensjö Lemming E, Melhus H, Byberg L. Milk intake and risk of mortality and fractures in women and men: cohort studies. BMJ. 2014 Oct 28;349:g6015. doi: 10.1136/bmj.g6015. Fordjour L, D’Souza A, Cai C, Ahmad A, Valencia G, Kumar D, Aranda JV, Beharry KD.Comparative effects of probiotics, prebiotics, and synbiotics on growth factors in the large bowel in a rat model of formula-induced bowel inflammation. J Pediatr Gastroenterol Nutr. 2010 Oct;51(4):507-13. doi: 10.1097/MPG.0b013e3181df5ff2. Portnoi PA, MacDonald A. Determination of the lactose and galactose content of cheese for use in the galactosaemia diet. J Hum Nutr Diet. 2009 Oct;22(5):400-8. doi: 10.1111/j.1365-277X.2009.00948.x. Astrup A. Yogurt and dairy product consumption to prevent cardiometabolic diseases:epidemiologic and experimental studies. Am J Clin Nutr. 2014 May;99(5 Suppl):1235S-42S. doi: 10.3945/ajcn.113.073015. Modler HW, Kalab M. Microstructure of Yogurt Stabilized with Milk Proteins. J Dairy Sci. 1983 Mar; 66(3), 430–437. Adams C. PROBIOTICS-Protection Against Infection: Using Nature’s Tiny Warriors To Stem Infection and Fight Disease. Logical Books, 2012. Case Adams is a California Naturopath and holds a Ph.D. in Natural Health Sciences. His focus is upon science-based natural health solutions. He is the author of 25 books on natural health and numerous print and internet articles. His articles and books can be found on Heal Naturally – and many of his books are available for immediate download on GreenMedinfo’s book library. Contact Case at case@caseadams.com.